ObjectivesWith the increasing use of multi-detector CT, the number of detected cases with coronary-to-pulmonary artery fistula (CPAF) has increased. Several previous studies reported severe cases of angina, but no appropriate tests to evaluate myocardial perfusion for patients with CPAF have been established. We evaluated the hemodynamic characteristics of CPAF using thallium-201 (Tl-201) single photon emission computed tomography (SPECT).Materials and methodsTl-201 SPECT was performed in 17 patients with CPAF, but without evidence of coronary artery disease on coronary computed tomography angiography (CCTA) (age, 58.5±13.3 years; 8 men). Quantitative analysis of scintigraphic data was performed. 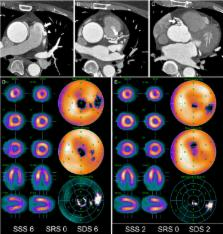 Additionally, perfusion abnormalities were compared with CCTA findings. Medical records were obtained to define clinical data, diagnostic findings, symptoms, management, follow-up data, and major adverse cardiac events (MACE).ResultsSix patients (35.2%) showed perfusion abnormalities on SPECT studies and could be classified as follows: 3 patients, no reversible ischemia (3/17, 17.6%); 1 patient, mild ischemia (1/17, 5.8%); and 2 patients, moderate ischemia (2/17, 11.7%). During the follow-up, ten patients (58.8%) improved under medical management and 5 patients (29.4%) underwent surgical ligation for CPAF with symptomatic improvement in 4 patients. Seven patients performed follow-up myocardial perfusion SPECT, and symptomatic improvement correlated well with scintigraphic perfusion improvement in 6 patients No MACE was observed.Clinical significanceTl-201 myocardial perfusion SPECT might be useful for determining the hemodynamic status and for risk stratification in patients with CPAF. Use of multiple biomarkers to improve the prediction of death from cardiovascular causes. The incremental usefulness of adding multiple biomarkers from different disease pathways for predicting the risk of death from cardiovascular causes has not, to our knowledge, been evaluated among the elderly. We used data from the Uppsala Longitudinal Study of Adult Men (ULSAM), a community-based cohort of elderly men, to investigate whether a combination of biomarkers that reflect myocardial cell damage, left ventricular dysfunction, renal failure, and inflammation (troponin I, N-terminal pro-brain natriuretic peptide, cystatin C, and C-reactive protein, respectively) improved the risk stratification of a person beyond an assessment that was based on the established risk factors for cardiovascular disease (age, systolic blood pressure, use or nonuse of antihypertensive treatment, total cholesterol, high-density lipoprotein cholesterol, use or nonuse of lipid-lowering treatment, presence or absence of diabetes, smoking status, and body-mass index). During follow-up (median, 10.0 years), 315 of the 1135 participants in our study (mean age, 71 years at baseline) died; 136 deaths were the result of cardiovascular disease. In Cox proportional-hazards models adjusted for established risk factors, all of the biomarkers significantly predicted the risk of death from cardiovascular causes. The C statistic increased significantly when the four biomarkers were incorporated into a model with established risk factors, both in the whole cohort (C statistic with biomarkers vs. without biomarkers, 0.766 vs. 0.664; P<0.001) and in the group of 661 participants who did not have cardiovascular disease at baseline (0.748 vs. 0.688, P=0.03). The improvement in risk assessment remained strong when it was estimated by other statistical measures of model discrimination, calibration, and global fit. Our data suggest that in elderly men with or without prevalent cardiovascular disease, the simultaneous addition of several biomarkers of cardiovascular and renal abnormalities substantially improves the risk stratification for death from cardiovascular causes beyond that of a model that is based only on established risk factors. Copyright 2008 Massachusetts Medical Society. SCCT guidelines for the interpretation and reporting of coronary computed tomographic angiography. Current address: Department of Radiology, Dongguk University Ilsan Hospital, Goyang-si, Gyeonggi-do, Republic of Korea. Fully automated wall motion and thickening scoring system for myocardial perfusion SPECT: method development and validation in large population. Long-term prognostic value of 201Tl single-photon emission computed tomographic myocardial perfusion imaging after coronary stenting. Identification of viable myocardium by dipyridamole-induced improvement in regional left ventricular function assessed by echocardiography in myocardial infarction and comparison with thallium scintigraphy at rest.